Despite the flurry of news about NFL lawsuits over concussions, the problem affects far more athletes at the high school and junior high school level, according to federal government statistics. 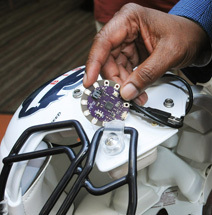 Currently, Dr. Gary Harris, who specializes in computer engineering and serves as associate provost for Research and Graduate Studies at Howard University, is working with engineering students and the Bison football team to devise an inexpensive concussion monitoring system, using an open source platform. (“Open source” is a tech industry term that means the equipment and information to create this system is public as opposed to proprietary, so as to encourage others to innovate and improve on the idea). 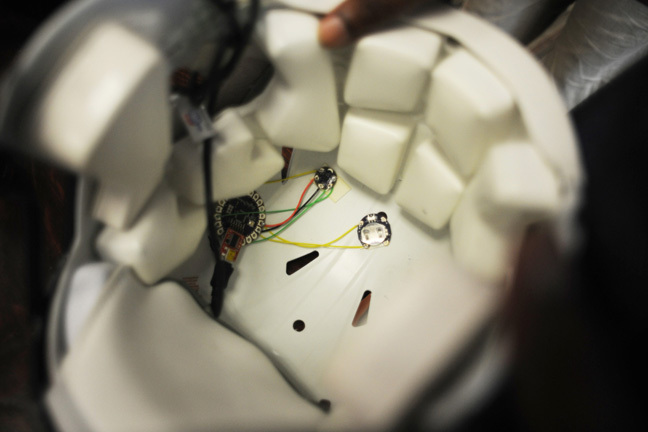 The project uses a computer chip attached inside the helmet that measures impact up to 100 gs of force. For reference: a sneeze is about 2 or 3 gs of force on the human body; an F-16 fighter jet barrel roll exerts 7 to 9 gs; a car crash at 45 mph is about 60 gs. Concussions usually happen with collisions between 80 and 120 gs. The chip records the force of impact for every collision—it can be programed to transmit this information wirelessly, say, to a cell phone app. Or, it can be downloaded from the helmet using a USB cable. It can also be programed to send an alert when a hit exceeds a certain threshold. Each of these chips costs approximately $30. Technology is also being used to improve care and outcomes the aftermath of serious concussion cases. Interactive Metronome, a health tech company that creates neurological research-based brain training programs and activities, is one example. The activities are designed around “brain timing”—the ability to clap to a beat, for example. As users play games and do activities that test their reaction time, those brain cell connections are repaired and strengthened. Originally (and primarily) used to improve motor skills and cognitive function in children with ADD/ADHD, the program is beginning to see success with TBI rehabilitation. Technology has helped improve identifying and treating concussions; on the prevention front, sports health care professionals now have the backing of the law. In all 50 states, a student athlete must be immediately removed from play if a concussion is suspected, and cannot return to practice or play without medical clearance. Some states also mandate that a student must remain free of symptoms or remain on the injured list for a set period of time, even if they gain medical clearance immediately. But there are still holes in preventing these injuries. He and Rheeling have both seen athletes on under-resourced teams get clearance from an emergency room resident, for example, in contrast with athletes who take a concussion test against their baseline with their team’s athletic trainer. They’ve also seen instances of students underreporting their symptoms, coaches resisting care recommendations, and parents being lax in monitoring their child’s rest after a concussion. Emerging laws are attempting to add another layer of protection by regulating the number of weekly practices involving rough contact drills, thus reducing exposure to collisions and risk of concussion. Trainers, coaches, parents, and athletes can also receive guidance through resources such as the American Academy of Neurology online Sports Concussion Toolkit, and organizations such as the Sports Legacy Network.